Hidden in a corner off the main yard at Dalemain is an often missed snapshot of Cumbrian history. To the left of the yard is a dark passageway with a pink sign above. 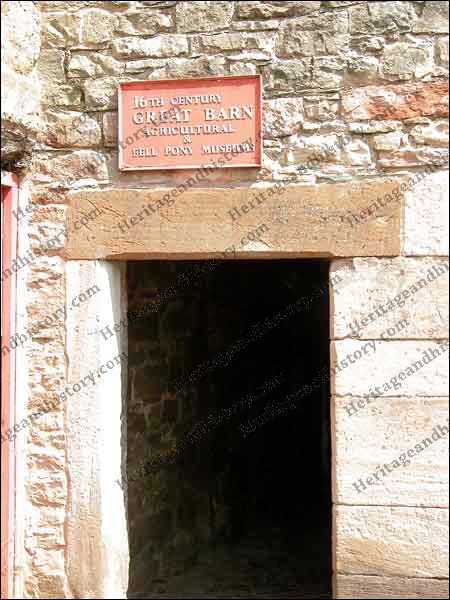 The sign reads 16th Century Great Barn. 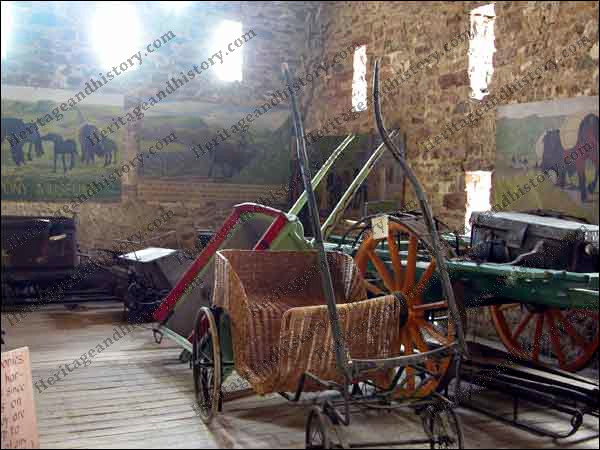 Agricultural and fell pony museums. Going beyond the alley and up a flight of stairs you enter into a dark cavern of a room with all sorts of wooden and metal paraphernalia. As your eyes get accustomed to the lack of light you realise that you have come upon a treasure trove of old farming implements and items from a long gone past. An eclectic mix of items, seemingly stuck in a black hole as time has moved on. Greeting us as we walked around on the creaky, quite flexible floor, sat astride a fragile metal frame, similar to that of an old childs pram was a wooden coffin. It was a simple affair of a number of rough cut planks nailed together with a lid on. We do hope no one was in residence! 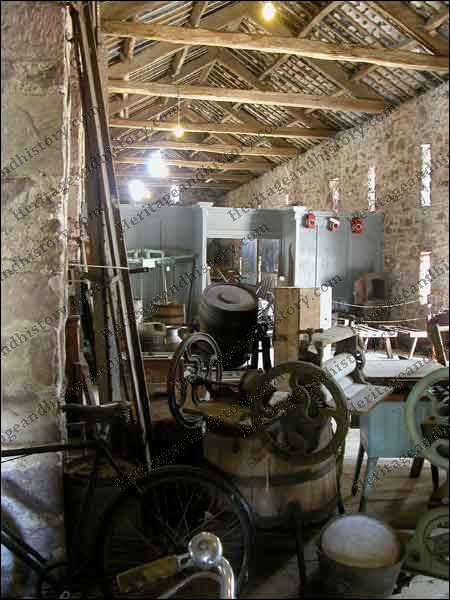 Pictures on the wall behind this exhibit indicate that Dalemain and possibly some of this equipment, had been used in a recent film based on the book Jane Eyre by Charlotte Brontë. This collection of milk churns caught our eye next. These are often seen now with plants growing from them in gardens but they were for carrying milk from the farm to customer. The churns could often be seen on railway platforms throughout the country early on a morning awaiting transport to cities or around the country. It is reported that churns were still being used upto the early 1970’s when road and rail tankers started to take over. Looking into the body of the room you can see all sorts of heritage. Hanging on the facing wall are some old paraffin lamps. These used to be used to mark roadworks or other road hazards. Flashing battery powered yellow laps are now used. See how many items you can recognise? At the far end of the vast loft is a museum to the fell pony. The fell pony was used in many of the early Cumberland industries. With their placid nature and strong build they could be found at many mines transporting goods across the fells or between villages moving goods and people. 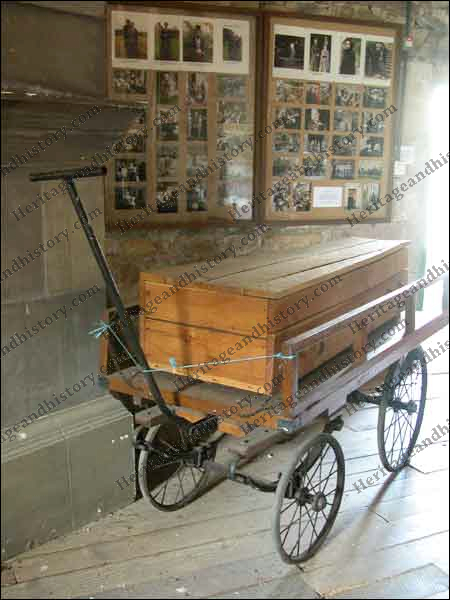 In the museum you can see many awards from the local and county shows as well as equipment such as carriages, carts and assorted tack. Her Majesty The Queen, is the Patron of the Fell Pony Society. Her Majesty the Queen has owned, ridden and driven Fells since she was a young woman. She also breeds Fell ponies which carry the “Balmoral” prefix.